Each drain cleaner has it’s own miracle claim and come in many forms from liquids and gels to powders and crystals. But do they work? The answer is often yes, as long as you choose the right product for the job. For kitchen plug holes where grease & food is trapped, select an oxidizing product. Bleach and nitrates release heat that loosens the blockage. For the bathroom back-up, choose a caustic drain cleaner containing lye. The chemical reaction uses electrons to release the clog. It transforms grease into a soap-like material that can then be washed away. Always wear protective clothing. You’re looking confused but if you have a metal coat hanger handy you can easily create a useful tool. Carefully un-bend the wire until straight, keeping a narrow hook at one end. Insert the hooked end of your wire down the plughole and keep going until you reach the debris. Using a hooking motion, repeatedly lift out the debris (you might need a nose peg) until the pipe is clear. Flush with hot water to remove any remaining grease. 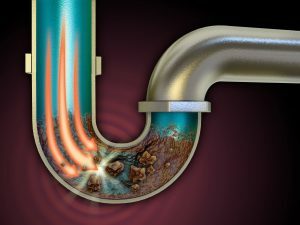 This video on YouTube by Economy Plumbing shows how you can unclog your drain. It might have been around for more than 100 years but it still works. The suction created by the rubber seal will pull out any hidden obstruction. Make sure any waste outlet and other nearby plugs are blocked with a wet cloth before starting. Cover the drain opening fully and then use fast, powerful thrusts for around 20 seconds. The pressure created should force out the problem.